There was a fascinating story come out of the UK this week about a couple who recently won £1,000,000 from doing the lottery – the Euro Millions actually. Okay, so that happens every week, what’s so special? What makes David and Kathleen Long unique is that this is NOT the first time that they have scooped a lottery top prize. 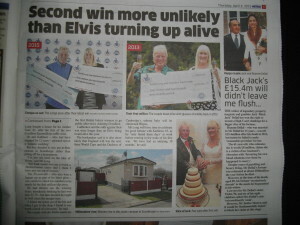 In 2013 they also won £1,000,002.70. Ohhh, and this time around, they also won a Jaguar car. Elvis being found alive in 2015. The England soccer team winning the next 3 world cups. The Duchess of Cambridge next born child being christened Wayne. 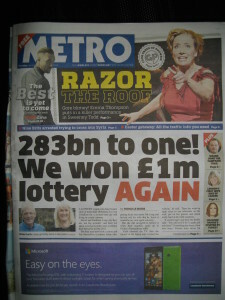 In other words, the chances of one individual (or couple) scooping 2x million pound jackpots are ridiculously high. In fact, it is 283 BILLION to 1. And the Law of Attraction Link? Now we have not spoken to either David or Kath Long, so we have no way of knowing if they know about, let alone practise, the law of attraction. However, what is interesting to note is that David Long is reported to have said that he “knew it would be my turn again someday”. He knew that it would be his turn again someday. Listen to what he says in this video after their second win. Finding love, or that ‘special’ relationship. If you know something with certainty (and that’s key here) then it will surely happen, even if that certainly seems ridiculously improbable to most other people. This is why the law of attraction works for people who don’t even know anything about manifesting. The flip side to this is the reason why people who know about deliberate creation don’t actually see success with it. As soon as doubt creeps in, then you can kiss goodbye to this fundamental law working for you. Here’s another interesting video, uploaded to YouTube less than a month ago. If you don’t believe that one, then we have lots more stories about success with the law of attraction in this article: Top 10 Law of Attraction Success Stories [videos]. The question is how much do you truly believe that your law of attraction dream will come true? Time to turn up that attraction volume to full blast and surprise yourself. Of course, if you don’t believe that you deserve that money, then you can easily lose the lot – just like these people. The beauty of it is that it costs nothing to practise the law of attraction (it’s free, just like the law of gravity is free). Take advantage of it. Make it work for you, not against you. How to win the lottery using the law of attraction (This is the most read article on our web-site). Law of Attraction Success with EFT, Hypnosis, and Subliminals. Attract Anything – Jon Mercer. How to Manifest a Miracle.